Offering programs for undergratuates interested in pursuing careers in music, as well as those who want to sharpen their skills or pursue music as an avocation. 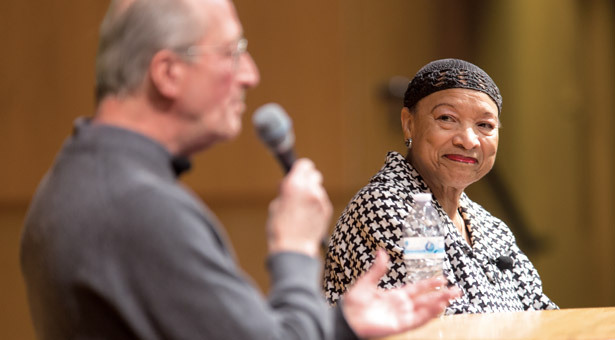 At the Futures in Music lecture event on January 8, 2015, musicians Lou Magor (left) and Pat Wright of the Total Experience Gospel Choir spoke about careers in worship arts. She’s a professional flutist, but Maggie Stapleton also works as assistant program director at Classical KING FM Radio. And when she spoke at a Futures in Music lecture this fall, she opened new worlds to Seattle Pacific University music students. Funded by SPU’s Spiritual and Education Resources for Vocational Exploration (SERVE) Program and organized by SPU’s Music Department, Futures in Music lectures connect students with top Seattle artists in everything from radio to recording to rhapsody. Speakers in the music industry, worship arts, performance skills, and leadership discuss their career experiences, answer student questions, and occasionally perform. At the same time, Futures in Music connects Seattle musicians with the university in mutually beneficial ways and reinforces what students are learning in class — the importance of a strong work ethic and a wide skill set. Futures in Music has hosted the likes of Lou Magor and Pat Wright of Total Experience Gospel Choir, film composer and founder of the Northwest Film Scoring Institute Hummie Mann, and former Seattle Symphony conductor and two-time Emmy award winner Gerard Schwarz. The SERVE grant also sponsors a visit from a health and injury specialist every year. Those connections have helped students land internships and jobs before and after graduation. Marshall Frimoth ’14 interned at Tooth and Nail Records, an independent record label based in Seattle whose CEO spoke at a 2013 Futures in Music lecture. A music composition major and business minor, Frimoth worked on promotions and social media for Tooth and Nail.